Next summer’s Silverstone Classic is already off to a super-fast start, nine months ahead of the festival’s return over the weekend of July 26-28 in 2019. A full range of Super Early Bird tickets went on sale last week, supported by the launch of a refreshed, new-look silverstoneclassic.com website. A special Silverstone Classic display will be wowing around 500,000 visitors to next weekend’s Regent Street Motor Show (Saturday November 3). With London’s flagship shopping destination closed to through traffic all the way from Piccadilly Circus to Oxford Circus, the wide pedestrianised thoroughfare is reserved for a unique automotive showcase, making it the perfect free-to-view shop window to promote all the entertainment the annual Classic has to offer, both on and off the famous Grand Prix circuit. On-track action in 2019 will again feature an unrivalled feast of retro races starring the full-spectrum of motor sport history and, as ever, the racing programme is just one of the top attractions at the three-day festival of Rocking and Racing. There will be more than 10,000 privately owned classic cars, displayed on the infield by over 120 car clubs, as well as a host of interactive driving experiences. The Classic will also feature eye-catching air displays, fun-fair rides, stunt shows, an adrenaline zone, a shopping village, live music concerts plus a host of other family entertainment, most of which is included free in the ticket price. As well as savouring a handful of the great cars that will be competing at the 2019 Classic, all those attending the Regent Street Motor Show will be able to find out more about what to expect from this year’s event. Famous cars on display in central London include an imposing Bentley Blower from the 1930s, a racy Mini Cooper S from the swinging sixties, a Ligier-Ford JS11 (pictured) from F1’s fabled DFV era, a V8 propelled De Tomaso Pantera and an Aston Martin DBR9 as raced at Le Mans in 2009. All those inspired by what they see on Regent Street can take advantage of a full range of Super Early Bird tickets now available for those buying before the end of the year. Offering savings of up to 22 per cent on Standard tickets, Super Early Bird adult admission starts at £35 with the price of the three-day weekend ticket frozen at £99. 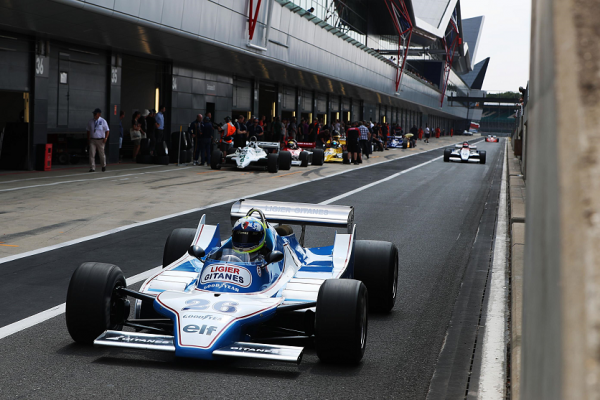 Full details of all ticket prices – including Parc Fermé and Clubhouse hospitality packages, the RetroRun and camping – can be found on the recharged www.silverstoneclassic.com website.